Not just a tribute to a beautiful bridge, but a thorough history of it. 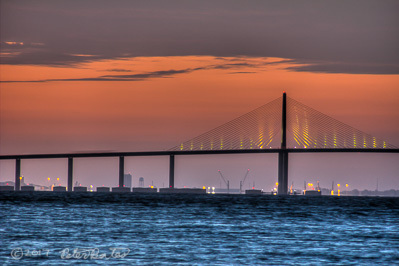 The Sunshine Skyway Bridge: Spanning Tampa Bay. By Nevin D. Sitler and Richard N. Sitler. Paperback. The History Press. The two Sitlers, Richard and Nevin, père and fils, have set out an ambitious task: to document the construction of this bridge and while doing so fill us in on the details of the lead players. But in most cases they aren’t just players in a vast undertaking, but characters in their own right. Like Governor Bob Graham, of the Bob Graham Sunshine Skyway Bridge. Florida state senator Bob Graham campaigned for governor with a “workday” program where he took on the jobs of everyday people, from housewife to policeman to short-order cook. Once elected, he retained his supporters by continuing the workday idea. As governor, Graham fought for construction of the present-day Skyway Bridge, spending a hard-hat workday there as well. Erupting like Jack Nicholson in his classic line from A Few Good Men (“You can’t handle the truth!”), Gandy lacerated board members. “They bear the stamp of one man, you say?” he uncharacteristically shouted. “You bet they do! And I’m that man! If that bridge is ever built…it will be by some fellow who gets behind it like I have and never quits.” The engineers were impressed and gave their immediate approval. Such men (sorry, no women) appear in special sections of the book called “Post Span.” In fact, the whole book is designed in a fashion that will appeal to the popular (as well as the scholarly) reader of history. 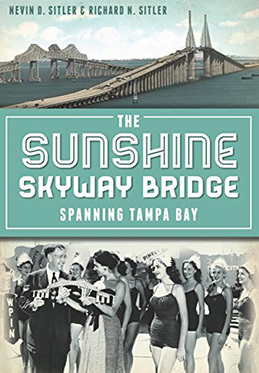 For example, it’s not just about the construction of the Sunshine Skyway Bridge, but about the other bridges that preceded it, as well as different modes of transportation across the bay like ferries and short hop flights. This gives the reader context for how difficult the engineering feats were, both in the early days and the present. The bow of Captain Lerro’s ship veered out of the channel and struck a support column on the southbound span’s support pier at 7:34 a.m., resulting in a horrendous collapse of the 1971 main span. Several automobiles, a pickup truck and one Greyhound bus soared at nearly seventy miles an hour into the bay 150 feet below. Thirty-six people fell into the bay that day. All but one died. This historical narrative observes the style you might find on a placards at an engaging historical museum exhibit. This is not surprising, since Nevin Sitler is the historian-in-residence at the St. Petersburg Museum of History. © Peter Bates and Stylus 2010. Unauthorized use and/or duplication of this material without express and written permission from this site’s author and/or owner is strictly prohibited. Excerpts and links may be used, provided that full and clear credit is given to Peter Bates and Stylus with appropriate and specific direction to the original content.